Worship is an integral part of our life here at Groton Congregational. Our service is a meaningful experience that involves the singing of hymns, saying of prayers together and an opportunity to share our joys and concerns. The scripture messages connect the readings to our lives in a relevant and memorable way. Special music from the choir, bell choir or other musicians is always an uplifting and a joyous sound unto the Lord. Yes! We love children at Groton Congregational! Children receive a special message from our pastor during our worship service, and then attend Children’s Chapel – a fun time filled with stories, activities and fun! Begin by coming through the big green doors – always open wide on Sunday! Our Greeters will meet you at the door with a smile and warm welcome. We know that many people connect most closely with God through music. 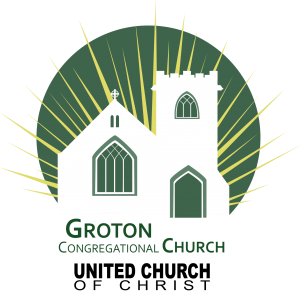 Knowing this, Groton Congregational has an active music program that involves our Sunday Worship Services, Concerts and Special Events. Church Choir: Our Worship services have an active choir program that sings each Sunday and rehearses each Thursday evening at 7:30 p.m.
Bell Choir: We also have a bell choir that performs each month during services and also periodically at concerts in the area. They rehearse on Thursdays at 6:00 p.m.
Special Music: We welcome the talents of all of the people in our congregation and encourage them to use of their musical gifts in service. We’ve had guitars, bass, trumpets, trombones, flutes and pianos. We’ve had duets, soloists and groups of all ages play during our services in the past few months alone! Whether you sing, play an instrument, or perform with a group, you would be welcome to join us here. We believe that the Sacrament of Baptism is an outward and visible sign of an inward grace open to all of God’s beloved children. As such, Groton Congregational is committed to welcoming anyone who wishes to be baptized or baptize their child into the family of faith of Jesus. You do not need to be a member or even someone who regularly attends the church, though we bet you’ll like it here and want to come back! Groton Congregational has one of the most beautiful sanctuaries in Connecticut. Complete with a classic, central aisle and original Tiffany Stained Glass, our sanctuary can accommodate up to 300 attendees to celebrate your union! All couples are welcome to be married at Groton Congregational Church.